Kristi Allen-Gailusha, a GOP nominee for a Montana House seat and secretary of the Big Sky Tea Party Association, has left the latter group, angry that its president, Tim Ravndal, was forced out following revelations that he posted remarks condoning violence against gay people to his Facebook page. You’ll remember that the other day, a Facebook posting started going around wherein Tim Ravndal, the erstwhile president of the Montana Tea Party group, joked with a friend about mounting gays as decorations, like Matthew Shepard. [His name was not mentioned, but for Ravndal to now claim ignorance means he’s either a liar or excessively stupid.] Then Ravndal lost his job over it. 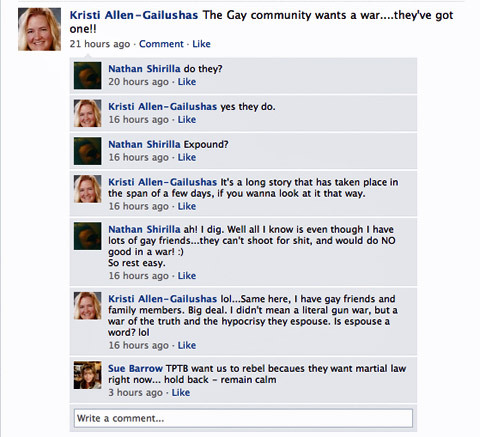 Haha, not a REAL WAR, said Kristi! A war of words! And yes, “espouse” is a word, so for answering that question correctly, the gays are already one point ahead of Kristi’s team! Also, try to calm Sue down, because she seems on edge about something.